Susanna Horenbout, a Flemish painter, sails across the channel to join the court of Henry VIII and on the way a dying man’s message is entrusted to her. 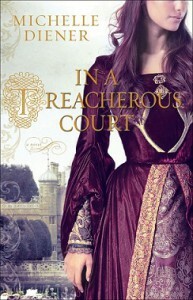 She immediately becomes the target of an unknown enemy and it falls to the king’s man, John Parker, to keep her safe. Together they unravel to the clues to a treasonous plot and the mastermind behind it. I thought this would be detailed with descriptions of painting–Susanna’s trade–much like Judith Merkle Riley’s The Serpent Garden. I found, however, that it’s mostly a historical mystery with a lot of chasing and fighting. Though it has an unrealistic plot, the characters have historical credence according to the Author’s Note. I felt it was too fast-paced to get to know the protagonists, and not nearly as detailed as it could have been. Some characters are fleshed out appropriately, but others had me shaking my head in disbelief at their behavior. I think with such well-known figures of the Tudor court, it is difficult for an author to claim an original personality and the attempt is not always favorable. Of course, I am not a big mystery fan–not even of the historical persuasion; I’d rather read a fat volume that encompasses an entire lifetime of the character than read of a few exciting and adventurous days or weeks. But if historical mysteries are your thing, this is definitely full of action and intrigue! I would recommend buying the eBook over the paperback, unless you are collecting it for its beautiful cover, because it’s a very quick read. The author is writing a follow up, Keeper of the King’s Secret, and those who like to own series books may also be interested in the paperback.